This week's guest blog comes from Tony Lake. Tony has long been a “friend” of the museum and is regularly inspired by the collection. A keen racing historian, he has kindly offered to contribute to our blog. It was essential that he acquired four horses that were up to the epic task and consequently scoured racing stables. Tawney was bought from Mr Greville, Roderick Random was purchased from Mr Stamford, Chance came out of the Duke of Hamilton’s yard and Little Dan from Mr Thompson at Beverley. Three of the four had winning form. The two leaders were Tawney, on the near-side, and Roderick Random, on the off-side, and including riders, saddles and harness, each carried about eight stone. Chance was the wheel horse on the nearside and Little Dan on the off-side, they carried about seven stone each. W. Everett, Mr Panton’s groom, was employed to ride Tawney and it was his responsibility to set the pace. The other three were ridden by three lightweight boys. Leaving no stone unturned livery had to be chosen and the postilion was dressed in a white satin waistcoat, black velvet cap, and red stockings; Mr Everett and the three boys wore blue satin waistcoats, buckskin breeches, with white silk stockings and black velvet caps. Newmarket Heath on the morning of the big day, 29th August, 1750, was very hot, very busy and full of expectation. The machine, with Lord March’s postilion carefully mounted, weighed about twenty four stone and started its journey at about seven o’clock. From Six Mile House it ran between the Warren and Rubbing Houses, then through “the Running Gap” at the ditch, next it turned right to run three times around a four mile track, and then back to Six Mile House. A groom, dressed in crimson velvet, rode in front to clear the way of the spectators and following up the rear was George Tuting and Lord March’s groom, just in case of an accident. The first four miles were completed in nine minutes… they were making good time. At the finish three umpires held stop watches and all three agreed the finishing time: fifty-three minutes and twenty seven seconds. They had made it with a cosy six minutes and thirty three seconds to spare. But, of course, one thing always leads to another. 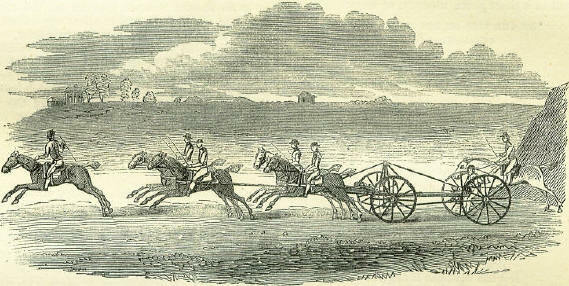 The episode announced the Earl of March’s arrival on the racing stage, which, as Lord Queensbury, he would grace for many years. The celebrated match was immortalised by Daniel Quigley’s painting which was later purchased by Fred Archer and after his death it was auctioned and bought by George Barrett for 17 guineas. Emm George Barrett? Time for some research.